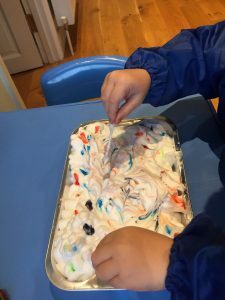 Shaving foam is a bit of a staple where messy play is concerned in our household. It’s cheap, easy to stick on the shopping list, and pretty easy to clean up without staining. This messy play was so simple to set up, but my 4yo amused himself with it for 45 minutes or so! 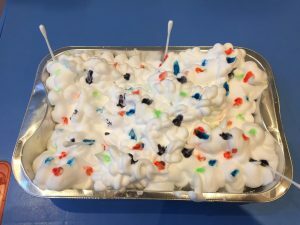 I simply squeezed a load of shaving foam into a metal tray (though any container would do), and dotted some gel food colouring in it with some cotton buds. I left the cotton buds in and put the tray on the table…My 4yo mixed, swirled, dotted, scooped, made pretty patterns and generally explored for a good while. He then asked for a pipette and some coloured water, so I duly obliged…I love it when he experiments! 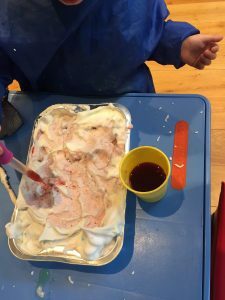 He then had great fun pipetting the red water in and mixing it around with the shaving foam. He put his hands in it to explore the texture, and experimented with different amounts of water in different areas. He loved it! And so easy – so everyone’s a winner!